I am a big fan of the Cold War. It had all the necessary elements for a good spy story on a daily basis. And they were true. Growing up during the some of the hottest times in the Cold War was kind of exciting. The Bay of Pigs, Cuban Missile Crisis, the Berlin Wall. All of these real life dramas made interesting fodder for the writers of spy novels and the stories they spun. 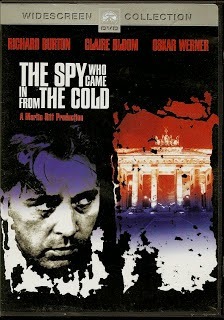 "The Spy Who Came In From The Cold" is one of my all time favorites. John LeCarre takes a man, a broken and tired man, Alec Leamus, and turns him into a political anti-hero. Here is a man who has been engaged in espionage against the Russians for a decade or more, who knows all the ropes, and yet finds himself caught in a web he inadvertently helps to create. The book and the movie are almost identical. It is helpful to have read the book first, but not necessary. Alec Leamus is asked by MI5 to leave the agency on the pretext of not having gained promotion due to his drinking. Richard Burton plays the part in the movie and his own public struggles with alcoholism make this role very believable. As he skids down the path of his affliction he takes a job as a research librarian, filing books in a private collection. There he meets a woman named Liz, played in the movie by Claire Bloom, with whom he forms an instant connection. Two lonely people trapped in their own gray and dreary lives. The film is in black and white. It is an accurate depiction of England at that time, still reeling from the ravages of World War Two. Rationing didn't formally end until 1965. Both the novel and the movie capture this aspect with perfection. When Alec defects to the Russian side for a price, at the direction of his superiors, a chain of events ensues that brings sharply into focus both the differences and the similarities of what we call Freedom and the other side calls Communism. Both sides have agendas. Both sides resort to unthinkable means in order to obtain their respective goals. Caught in a struggle between a principled Communist Party member who tries Leamus for espionage, and a ruthless ex-Nazi who may be a British double agent, Leamus finds himself in the grips of a plot that will either reinforce his beliefs or tear them apart, revealing them as the other side of the same coin. The book is riveting, as is the movie. Richard Burton gives one of his finest performances as the troubled spy. And Claire Bloom is exceptional as a woman torn between her beliefs and the reality with which she finds herself confronted. Stark and intense writing give the book the feel of the gray and colorless world of Communism in Eastern Europe at the time. Stark and intense direction by Martin Pitt transfer these elements to the screen with perfection.